The economical metamorphosis will begin with new terminologies, new measurements and most importantly with the delivery of "truth"-- all the time with full digital access. The new global landscape has dramatically changed and exportability of goods and services with boundary-less innovative entrepreneurial excellence is becoming the new phenomena. Being Google, any name chosen for its new parent company would have created as much frenzy as 'Alphabet' has. But while 'Google' was certainly unique, 'Alphabet' is anything but. What's behind this name game? The hyper accelerated world has changed in every aspect impacting everything around our work and lifestyles. So how has this ‘global age’ created its own new global age laws of business expansion and how do they apply to our new existence? If your organization still lacks a Tsar of Innovation with a clear mandate to define and manage the future you most probably are suffocating in an already dead organization and possibly missed the boat a while ago. Innovate or die, that simple. Today, Age of Abundance is a useless notion: The fact that there is too much replication of inferior ideas now overflowing and drowning us in mediocrity the age of abundance is useless notion. It’s not the abundance of news; it’s same news million of times over. Mankind is hardwired to understand darkness. That is why the light bulb was invented. Technological advancements helped to provide light, but when brightly lit chandeliers starts creating even more darkness, only common sense that will enable us to find the way out. AMERICAN LEADERSHIP: Are We Really Smart Enough For 2017? Everyone is shouting about how dramatically the global world of commerce has evolved, changed and moved forward, but how about us and our own smartness? Innovation at best is like a water sprinkler on a nice healthy plant, making it grow and blossom; however, sprinkling without the plant is just like watering sand. Nothing happens. The world economy is passing through the eye of the needle and in most places appears barren or at a complete standstill. When 2020 gets here, we will find that the corporate world will be drowning in the greatest flood of unemployed executives of all time due to highly advanced and very timely “block-chain” technology and brand new digital procedures. Prime Minister Modi of India is charging ahead towards global age thinking, and he is catapulting India in the global age spotlight. It is India’s vision to reach image supremacy of innovative excellence and to master nouveau entrepreneurialism. to the image supremacy and rules of the game. special agendas,tight timelines with specific national and global targets. First ever book by 1993 written on corporate nomenclature addressing the centrality of business naming issues. 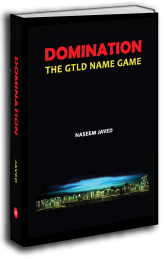 It outlined, classified and defined the types, styles, trends, success, pitfalls and corporate culture towards naming. The book was well received around the globe and went in 4th printing, created a healthy debate on naming issues and provided fresh education. 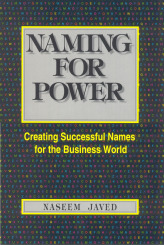 It also created the trends and formulated the recognition of naming as a most critical issue of business communication. The popularity of the book also helped in creating tens of thousands naming consultants during the dot com e-commerce boom. Still in libraries of trademark law firm and agencies around the world the book is out of print. Although the naming trends have drastically shifted and markets have changed this book still provides a rich overview and a point of reference on the period.